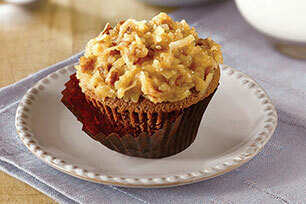 These cupcakes are a casual version of traditional German chocolate cake that's perfect for bringing to a potluck supper. Microwave chocolate and butter in large microwaveable bowl on HIGH 2 min. or until butter is melted. Stir until chocolate is completely melted. Add sugar; beat with mixer until blended. Add eggs, 1 at a time, mixing well after each addition. Blend in vanilla. Combine 1/2 cup flour, baking soda and salt. Add to chocolate mixture; mix well. Add remaining flour alternately with buttermilk, mixing well after each addition. Bake 25 to 30 min. or until toothpick inserted in centres comes out clean. Cool cupcakes in pans 10 min. Remove from pans to wire racks; cool completely. Frost cupcakes with Coconut-Pecan Filling and Frosting. Prepare batter as directed; pour into 13x9-inch pan sprayed with cooking spray. Bake in 350°F oven 50 min. or until toothpick inserted in centre comes out clean. Cool completely. Spread with Coconut-Pecan Filling and Frosting. The Coconut-Pecan Filling and Frosting recipe makes 4-1/2 cups frosting. Only 3 cups frosting is needed to frost these chocolate cupcakes. Refrigerate remaining prepared frosting, then use as desired, such as spreading onto cooled baked brownies or banana bread.